You know it's a Friday again when you see that! Woot! The Mister and I enjoyed seeing the little neighborhood darlings who came to the door last night. I hope you had a wonderful Halloween walking with your trickertreaters or dropping huge fistfuls of candy into their collection vessels while their eyes widen with delight! Adorable! It's fun to see how siblings imaginations are so individual! For this week's Merry Monday, we are to employ a Santa on our cards. As the days shorten and speed by, Christmas is barreling down on us. Don't say I didn't warn you. This site is a great go-to site for inspiration, and no wonder, since the Design Team and gallery cards are always outstanding! 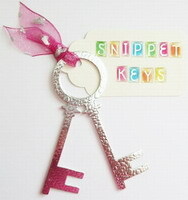 I'm finally using snippets this week, so I can go play with my friends at Pixie's Crafty Workshop! It's so nice to have our beloved Head Mistress back from vacation. She still has no idea about the cabbages. 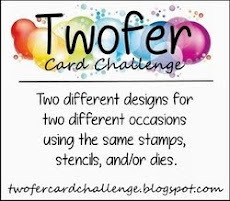 And if you haven't seen this week's MUSE Card Club inspiration card, check this OUT! Is that not the coolest card?! Janet Ribet of Swanlady Impressions is the wonderful MUSE this week and I couldn't wait to play along! My gnome is NBUS and it's from Paper Smooches. I can't take credit for the genius idea of turning a gnome into Santa. I saw it recently on this post by Elena on her Just Me website. Thank you again, Elena! I placed a hill of snow onto my card and overlaid it with piece of snowy vellum. I didn't even have a whole sheet of the vellum in my stash and, boy, do I wish I knew where it came from so I could get some more of it. The snowy vellum was placed over the card and the word "peace" (also NBUS) from a PTI set was stamped onto the vellum. Then my fussy-cut Santa ganome, colored with SU! markers, Wink of Stella, and Glossy Accents, was popped on top. It is hard to capture the sparklyness of the Wink of Stella in Santa's beard and mustache. I see now that I forgot to color his little cheeks, nose, and ears in a rosy pink. Oh well, let's just say it's SOOO freezing cold where he is that all the color has drained away! Next I popped on Santa's hat ball made from a circle punched from more VOS in my stash, a sort of brushed velvet that I've had since forever and only use for Santa's hat ball and Easter bunny tails. Normally Santa's shoes would be shiny black, but I had to make them lushilicious blue orbs to mimic Janet's droplets of yummy color. As long as we're talking about MUSE, I'd like to thank all of you who either participated by CASEing my card last week or left me sweet comments about the card and post. Mwah! "Hi everyone. I know I've said it before, but it bears repeating; you can make some wonderful friends through crafting/ blogging, and I'm lucky enough to have some of the best on the planet. One of those beautiful people is Anne (Redanne) who I'm sad to report is poorly at the moment. It is a measure of her incredible selflessness and thoughtfulness that, lying in hospital after a fall at the weekend, one of her first concerns was to let her blogging friends know that she wasn't ignoring them deliberately or falling behind on commenting on their work. "Knowing Anne, she'd be mortified that I'm letting you know and asking you to send your thoughts and prayers her way as she never seems to think she is worthy of attention. Knowing you guys, you'd be equally mortified that you'd been left unaware of Anne's plight and the opportunity to send those thoughts and prayers her way. On the horns of that dilemma I thought it right to keep you all 'in the loop'. I'm sure there'll be lots of you out there who will be putting those crafting skills to good use creating a little something for Anne. For those [in the UK] who would like to contribute to a collection for some flowers on Anne's return home, please contact Brenda Brown (another of my 'rocks') who has incredibly kindly offered to coordinate this; brenda_brown25@hotmail.com." Thank you for sharing so beautifully, Jenny. If you could take a moment to send Anne your positive vibes or prayers for a smooth and speed recovery, I would appreciate it very much, as I know she would. If you would like to send Anne a card, please email me for her address. (My email link is located on my profile page.) Thank you! I'd also like to thank our newest friend Viv of Viv's Visuals for joining us! 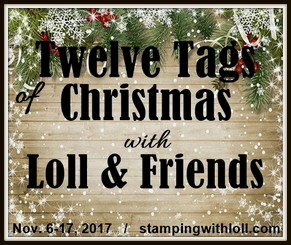 Viv has been blogging since 2008 which means you could lose yourself for days and days enjoying her wonderful works of art! Welcome Viv, we're so happy to have you join the party! Saying a prayer for Anne right now!! Hope you hear good things soon!! The twinks look great! Bet they enjoyed Halloween! Love the colours and snowy vellum. A fun, sparkly take on the Muse Challenge. Thanks for playing. Darnell, this is utterly charming!!! I love your gnome Santa and how you combined the challenges. Love the green blue shoes and hat and the vellum overlay is GAWJUS! The twinks are just too cute!!! Great photo. And your Santa gnome is adorable, perfect for Merry Monday! love that Santa in blue! A great card Darnell - the muse card was wonderful and your own interpretation is terrific! Thanks for the mention too - appreciate it!! 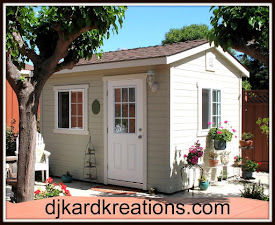 Hi Darnell... enjoyed reading your post... love your card... as always! And I love your gnome santa! One of my blogging buddies (Mina (Pinkpuds) mentioned recently that actually traditionally, santa's costume was blue or green, depending on what country you lived in. It was changed to red by a certain soft drinks company for their seasonal ads! So technically, you *did* make a traditionally coloured card! lol. Wowzers the twinks look GREAT, bet they brought home a big candy haul!! What a fun card Darnell, Mr. Santa G. Claus is s hoot!! Prayers for Anne, she sounds like a lovely lady. So creative & cute & perfect for the challenges, Darnell! Darling picture of the twins! The twins are adorable all decked out for Halloween - hope they had fun. Prayers being sent for Anne too. Love the costumes! Santa Claus came to our house last night - said he was collecting candy for the elves who were too busy in the workshop to trick or treat this year. Santa G Claus is delightful - I know I have some of that same vellum stashed away somewhere and can't believe I never "saw" it as snowfall - well done! LOVE this Santa / gnome ~ the coloring is fantastic and the snow vellum is just fab! The twins look cute as ever. Snort, that made me laugh! A Christmas Gnome, only in Darnell's world, lol! Lovely card you cased too. Only one set of trick or treaters for us last night. I rained absolutely all day, and I really do mean ALL DAY! Poor wee mites didn't look happy! This is a really fun take on this week's Muse! I love the 'traditional' colours! Thanks for joining us this week! Great card and photos Darnell. Those little fellas look so flipping cute - I'd have given them two dips into the treat bucket here! Well we had a bowl of sweets and chocklit bars ready by the door and not one trick or treater in sight all night!! My grandson on the other hand had 3 sets bang on his door and when it got to the 3 set of children who dived into the fast diminishing sweetie pot he was most put out and said 'Hey not too many!!!' Thankfully my daughter had a separate bowl for him hidden indoors so all was well especially as his bowl had plastic mice in it too. Love your Gnomie BTW and sending healing thoughts for Red Anne. Hugs Mrs A. Love it Darnell, your card is adorable. Thank you for joining us for Merry Monday. Too, too cute. Love the blues and the snowy vellum. You've really made those shoes shine, too. I love your card!!!!! Yes Redanne will have my prayers and visualizing her well and vibrant. Gnome Santa is precious...so dang cute it's silly. And the boys look spectacular in their chosen identities. Thanks for sharing. What a fun "Santa"! Love those shiny shoes and fuzzy hat ball! Hee, hee, never heard it called that before. Makes me think of hair ball, but that's a whole other fuzzy. Thanks for bringing him over to Merry Monday to join the Santa fun! So cute and creative. Love it, especially the snowy vellum. Thanks for leaving me some love on my blog. I love reading your posts, very inspiring. My best to Ann. Love your blue gnome Santa!! The boys look very smart. Not one trick or treater here so I have lots of sweets going spare! Always have some on hand just in case, but rarely get any callers. Just love the boys costumes Dippy.....and their individuality; amazing. As for your Santa G Claus he's absolutely great. Love the colouring - looks so good in these colours (it is correct about a certain drinks company changing his outfit to red!). Thoughts and prayers being sent to Anne.....can you let me have her address so I can send a card please. Your Santa is the sweetest ever. Love the colour combo too. Santa Gnome! Yep only at Darnell's! (grin) The twins are adorable. Love the fur ball on Santa...bet it would make a great beard too. I'd say very cold, so cold he was kissing Mrs. Santa Gnome and got her lipstick on his lips. giggle giggle Oh is this a PG rated blog? :)) And...well wishes and prayers going out to Redanne!! Two handsome military men...both thrilled to be defending their country! Santa G Claus has got to be the funkiest Santa ever!!! Elena is one resourceful crafter! You turned her idea into your own by coloring him with these totally non-traditional colors. 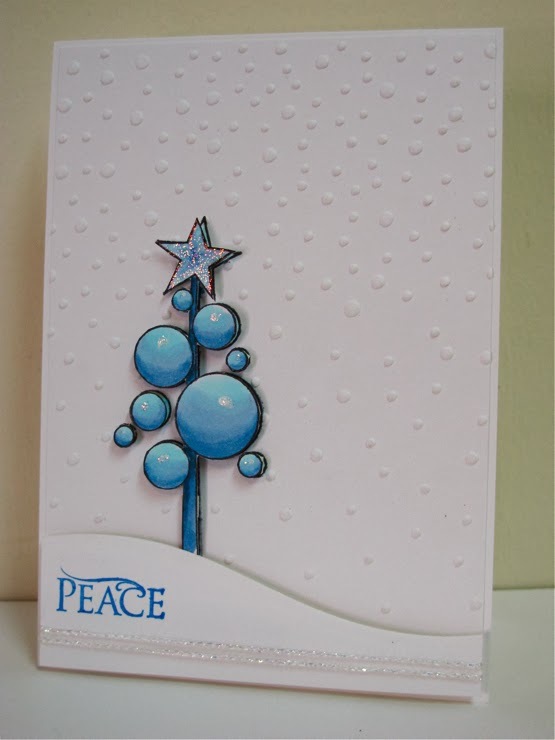 Love the gloss and the gorgeous velum snow! Darnell, I love Gnomey Claus so much! I am a HUGE fan of the non-traditional...the fabulously coloured green and blue Santa is right up my alley! So sweet! Thanks for sharing the story too about Anne - we are so lucky to be part of such a caring, thoughtful community! Thank you so much too, for leaving a little note on my blog about my little sabbatical - my heart was smiling to know that you had missed me xoxo!!! Love the pic of the grands in costume too! So different and both so cute!! What a cute pic of your grandtwins, and a super card, too. I think your gnome makes a perfect Santa and I don't mind him being blue. In fact I have a handmade Santa dressed in blue. And the snow is on the vellum? I thought it was an embossing folder. I'm sorry to hear about Redanne. She's in my prayers for sure. Darnell I know you don't want to hear this, but the twinks are growing up and looking quite dashing for Halloween. 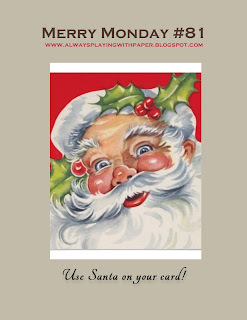 Gorgeous cards as always and I love Santa Knome! Santa G Claus looks very dapper in his blue and green!!! I love the vellum snow! So pretty! The twins look so handsome! The inspiration card is sensational . . . but then so is you gnome Santa . . . how cute is he? I don't know Redanne, but will send positive thoughts her way nonetheless! I have this stamp and you have now given me a few more ideas on how to use him! Thanks for the inspiration! Darnell, thanks for the smile. I love to read your conversation. Your card is so cute, and the colours are fabulous. Thanks for sharing at Merry Monday. Santa G. Claus does look icy cold. I'm hoping you warmed him up and added some color to his cheeks after you posted him!!! The twinks look fabulous....ahhh, yes different personalities!! The MUSE card is fab...what a funky tree... And your Santa gnome...just as funky!! Fantastic card!! Sweet kids...just too cute! thank you for sharing their photo. As for your card, just too darn cute...I love that little guy and did something so fun with him! Thanks for sharing about Ann too, will be sure to keep her in my prayers. Darnell, I love your Santa Gnome, he is so different and I love that you haven't get the CC colours. He is much nicer looking in those bluey green colours. He looks peaceful to echo that lovely sentiment. And of course I will pray for your friend Anne, for healing, for peace and for the joy of the Lord. Oh boy that is a darn cute gnome santa and those grandsons are just as cute. How much time do you spend reading all these lovely comments and then find time to make amazing cards? This is so much fun, Darnell! 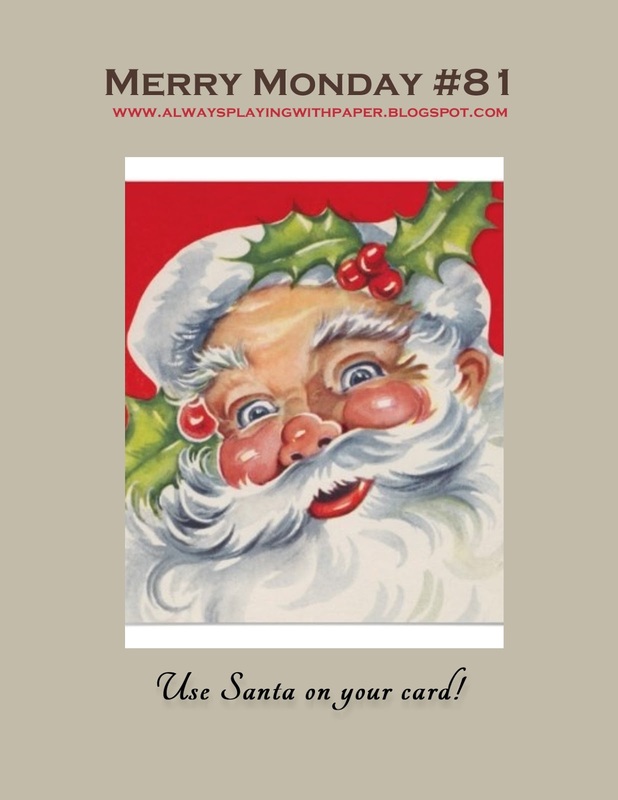 Love the blue and white card with Santa! Great idea. The twins look fabulous for Halloween! Bet they had a great time! Thank you for joining us at Merry Monday! Wonderful card, Darnell! Love your cute Santa and the bright and cheery color scheme! First off the twins....adorbs! I love their costumes! Your card is adorable too! I love your coloring and he is just too cute! I read your comment and was unsure what you meant about the email address and now I know and will click the box. I use a different email address for mail and this is just for the blog and a third account is for junk. Can I keep them straight? No I have to look on my I-phone - a fourth account. Cute! Love the vellum overlay. Must remember to try that out! Your grand-kids are adorable. Love their costumes. Awesome! Lovin' your Jerome atop the snow. And you have such a big heart... you know that. Positive vibes going Anne's way.